Food Poisoning! And the team that healed me. An hour or so earlier, Alex had done a fairly good job of inserting the needle to insert anti-nausea medicine, and then a bag of fluids. (I’ve had better, but I’ve had worse as well.) I was quite in need of these mind you, as I had been throwing up since 2am and was parched and exhausted. Alex was both friendly and efficient..at the same time. A bit earlier than that even, Zetta my admittance counselor from up front, had come back to see me and ask a few contact questions. Then we talked about her upcoming vacation to the Smoky Mountains in Tennessee. We had a great talk, and it was so nice to get to know her a little bit. She exuded positive vibes. I needed that smile almost as I needed those fluids. Every time a team works well together, it becomes more than the sum of the individual parts. It becomes the strength and potential of “the collective.” A force that can bend rivers, build dams, and change cultures. That potential, is awesome. So, before speaking at TEDx this weekend, (www.Tedxyoungcirclepark.org) I want to say thank you to the team at Memorial Hospital for healing me. You have a very tough job, and experiencing your drive help, your collaborative spirit, and your smiles was inspiring. I hope that I don’t see you again for a long, long time! Now, let the music carry you forward. Assemble that couch! Not what I had in mind for team-building. Sometimes it all just goes so wrong. Like tonight for example. I was at a casual, family BBQ. After awhile, when everyone had eaten enough to feel compelled to loosen their pants, a friend and I were told (as two of the younger adults there) that we needed to help the hostess move the furniture back into place. Mostly that meant moving pieces of a large, hefty L-shaped couch back where they belonged. This alone would have been fine. Truly. However, the big fun here, was that we had to latch each individual piece of couch, to the one next to it. Blindly, and by somehow lifting bulky components onto the little, proper male/female metal parts at the very bottom of the couch. Now, he and I were game mind you, to do most of these. We were making good progress. The engine was going up the hill. The nail was almost into that wood. The runners were almost at the finish line! (catch my drift here?) But, a few of the pieces were tricky to latch on to one another. THANKFULLY, there was however, no shortage of supervision from about 9-10 other people standing around. They were pointing, gesturing, making wonderful suggestions, and generally telling us what to do. AND…as a bonus, asking us why we “did it that way?” etc. All of this couch seat driving, was NOT very helpful. But it did remind me of one too many meetings attended over the years, that had felt this way. One too many events over the years…that had gone this way…one to0 many projects, over the years that had crashed and burned this way. TOO many cooks in the kitchen, too many chiefs. Not enough warriors. Not enough doers. Not a culture of let’s all pitch in, you know…like the AMISH do when raising a barn for a neighbor. So, what am I getting at here? So what about the couch? Identify your mission. Find your crew. Find the 5-6 notes in your chord at work, at church, at the rescue shelter, in your community. Plot the course. Re-focus on your purpose. Assemble your pieces in harmony, and go do good work. Now if we can only finish getting this recliner to latch on correctly! See you at TEDxyoungcirclepark.org ! Break down the silos – What does team building in Florida look like in 2018? 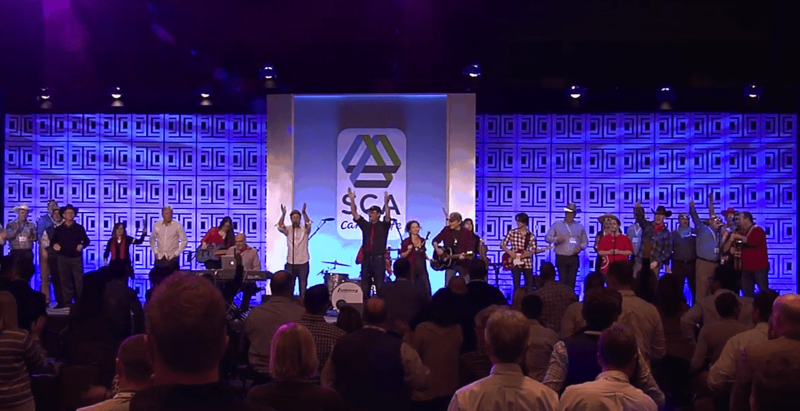 The Song Team brings high energy with the intimacy and engagement of a breakout, to a keynote audience at the Omni in Nashville. In 2018 what does team building in Florida look like? Well, whether it’s a ropes course, a beach relay race, or writing a song with us here at THE Song Team, With every passing fiscal quarter, and across industries from Technology, to Retail, to Healthcare, knocking down those old,long-existing silos is more necessary than ever! If your team members can’t play nice with others, you have a problem. If it still feels weird for the people in your creative design department to be working on a project with your accounts management team, then Houston, you have a problem! The common thread that connects the modestly successful songwriting team of Lennon & McCartney, with teams such as Gates & Allen, or the Zuckerberg “family band” is….and ALWAYS WILL BE Collaboration! It’s takes patience, persistence, and an open-mind to create a culture of true collaboration, where previously one didn’t exist. Learning each other’s communication styles, clearly discerning the different (sometimes hidden) talents of various team members, it all takes time. But this process is necessary before we find the success we crave. It is necessary that we can all accept as we sit around the proverbial table and brainstorm new ideas, innovated products, or solutions…that we only get there once we understand that sometimes we all have to agree to a certain level of discomfort being part of the norm, when moving a song, new gadget, or a new set of services from the ideation stage, to the stage of being in millions of homes across the globe. Got that Alexa? Listen to the other, find each individuals strengths, listen for where the passion lays for each person, help someone else bring their concept to fruition…and you as a leader and team player will be amazed at the long-term results. Last week I flew back up to Nashville for Song Team, Team-Building gigs with Bank of America and SCA. The gigs could not have been more different. Tuesday night Scott Barrier, Sherrie Austin and I teamed up with 50 enthusiastic folks from Bank of America in an intimate setting. This was the first face to face meeting ever between these two departments, and we were honored to kick off a new era of collaboration at this forward-looking company. The next day, 11 other writer/facilitators and a full-band were my partners, in giving an interactive keynote for over 400 attendees at SCA where over the past year a merger has occurred, and where after a year of prep work this highly innovative, and creative company is moving forward with ONE vision. We were honored here as well, to be part of a new age of creativity, collaboration and innovation at a Fortune 500 company looking towards the future. What impressed me most about our clients on this trip was that the leadership in both instances, really seemed to “get it.” What did they get? That’s what they got. And it’s clear, that both companies are on the right path. Keeping their eyes on the success of both their internal AND their external customers’ needs. And guess what, because of this strong leadership, the employees for these companies are ALL IN! On the trip back, Southwest Airlines impressed me, as they’ve done so many times before. For some reason, I didn’t check in early enough. Which, since I travel with a big ole’ Gibson guitar, is something I take seriously…usually. I want to make sure there is always overhead space for the instrument. When you travel in C group, occasionally, you may be out of luck. Southwest though, flying to and from Nashville, is typically VERY sensitive to the needs of musicians. Here I was wandering onto the plane late, and the attendant at the front, without prompting from me, had already seen my guitar, and radioed back to her counterpart near the rear of the plane, to “reserve” a spot for my guitar to rest….she knows how many of us pickers feel about checking our babies. I truly appreciated that. Small detail, but makes a difference! Near the end of the flight, the crew dimmed the lights, and asked us to close our window blinds. They they turned on some small emergency lights as “Candles” and sang happy birthday to a surprised passenger. This is “business as usual” for the Southwest team. But on a daily basis, their business as usual creates thousands of loyal customers….daily.